TAAP Conferences are a great way to Network, Learn, Present, Exhibit, and Collaborate. The TAAP annual conferences will provide a well-balanced educational experience focusing on the needs of addiction-focused professionals. Innovative sessions and cutting edge presenters will provide education you need to get ahead in your job and provide the hours you need for your certification or license. 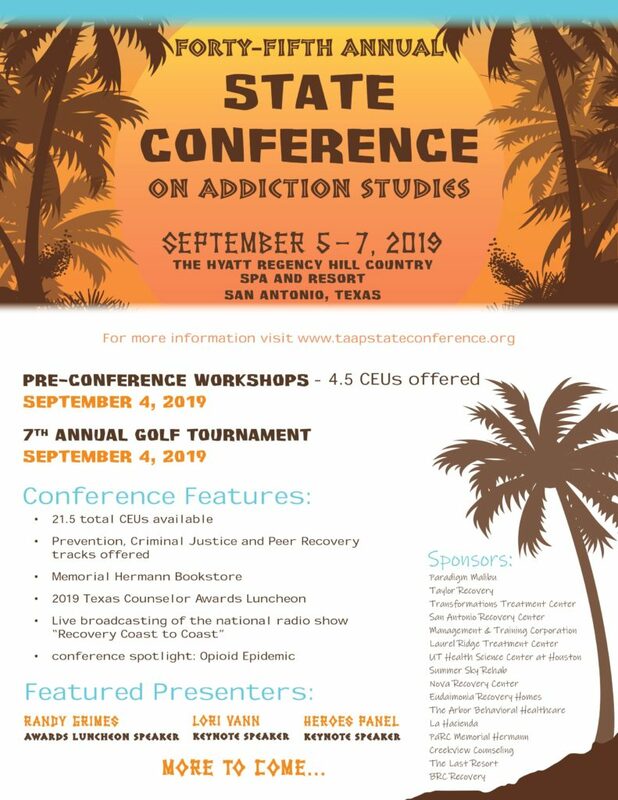 The TAAP annual conferences will include keynote speakers, daily plenary sessions, breakout workshops, TAAP Political Action Committee meetings, and most conferences will feature an all-day, pre-conference seminar. The conferences also feature Award Luncheons honoring outstanding addiction-focused professionals from around the state. There are also optional evening events, to allow you more time to network with some of the brightest professionals in the industry. There is always time to enjoy your visit to each location, taking in the sights, historical, and cultural heritage. The volunteer program is only open to members of TAAP. Not yet a member? Click Here for membership rates and information. Volunteers will be awarded full-conference access for the day(s) they volunteer. The conference volunteer programs are very popular. We receive many more applications than available shifts and not everyone who applies will receive a shift. Once the schedule is fully staffed, names will be added to the conference volunteer wait list. We will notify potential volunteers by e-mail.